Dimensions:Mount-1/32x2 3/4 Screws-1 3/4 Anchors:1 1/2 Locking Carabiner-3"Long, Thickness-1/32 Ultimate Suspention Training Support Kit that you may need for permanent or temporary anchoring.We provide you with all tools you may need to use it on multiple types of surfaces and applications on wall or ceiling. For Concrete Applications use a pre-drilled hole and the use anchor included. One Eye Plank when properly installed can hold up to 450lbs(900lbs Combined for this Kit) which can be suitable for sing it outdoor for swings, hammocks, etc. One Eye Plank with Locking Carabiner is suitable to hold your Suspention Systems, Boxing Equipments, Olympic Rings Yoga Swings, Hanging Chairs.With both pieces you will be more than comfortable to experiment and exercise. 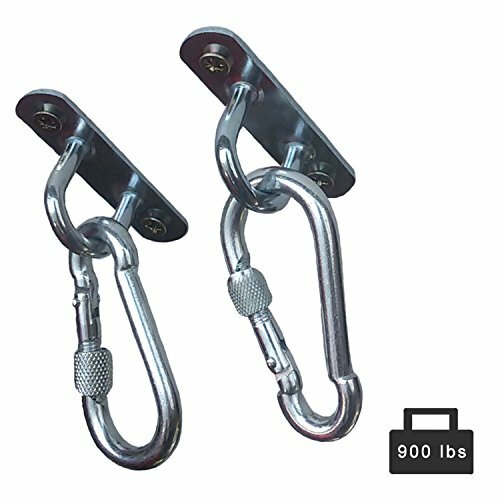 Each of eye bracket with carabiner can hold up to 450 lbs and with the 2 included in this kit have combined holding power of 900 lbs. If you have any questions about this product by Self_Repairvane, contact us by completing and submitting the form below. If you are looking for a specif part number, please include it with your message.